We are fully aware of the high expectations of our clients and therefore guarantee an unrivalled hunting and accommodation experience. 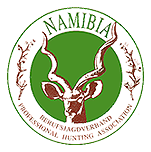 High quality trophies...luxury accommodation... sumptuous meals...warm hospitality...attention to detail... sun sets in explosion of colour...crisp clear starlight... the sounds of the African night...... all ensure that your Africa hunting dreams are met. Our beautiful thatched lodge offers exclusivity and luxury in true colonial style. 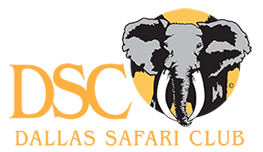 Kalahari Safari opened a spa in April 2012 - the first outfitter to combine hunting and spa! The silence of the desert, the stars at night and the emptiness that stretches to the horizon provides a ready-made antidote to the stress of life. For those needing further rest and relaxation, Kalahari Safari provides guests a range of offerings to rejuvenate both body and soul. Massage and desert crystal therapy, exfoliating treatments and much more – a wellness stop worked into any hunting itinerary is always a good decision. 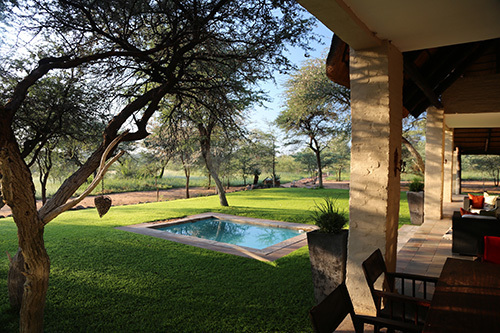 But what better way to relax and shake off the dust than a massage or soak in an outdoor Jacuzzi in the middle of the desert, with views of the watering hole infront of the lodge. You will be treated to sumptuous meals, with a variety of European and traditional African cuisine being served either in the dining room overlooking the waterhole or outside on the deck. Please advise if there are any special dietary needs i.e vegetarian, diabetes etc.